Today is weigh in day and I lost 9.2 pounds for a total of 29.2 pounds. I definitely feel very deserving of that weight lost because I worked super hard and followed the Skinny Jane Diet exactly as instructed. It is meant to give you a jump start on your weight loss to get you motivated to lose more. Skinny Blend - It is a super yummy weight loss shake that has a special blend of 7 proteins that help "curb your appetite for up to 4 hours and energize you." Each serving has 100 calories, only 1 gram of sugar, 3 grams of fiber and 12 grams of protein. Skinny Burn - Is a weight loss and fat burning supplement. It has 9 ingredients that work to "help speed up your metabolism, boost your energy, and control your appetite." Skinny Cleanse - "Cleanses your body by removing toxins and impurities from your system. In turn, your body will be a much better fat burning machine. This is a gentle cleanse that is very safe and does not cause any stomach discomfort." Day 1: As soon as I woke up I took the skinny burn and skinny cleanse. About 15 minutes after taking them I was super energized. I felt like I was doing things at a faster speed. I felt great and didn't feel weird or jittery. Super big plus! Thirty minutes later I drank the protein shake. It tasted like not so cold chocolate milk. I then followed the meal plan and took another skinny cleanse at 5pm. I also drank about 2 cups of green tea throughout the day. I was surprisingly never hungry and kind of had to make myself eat. One thing to consider when doing this diet is that you will go to the bathroom ALOT. It is not uncomfortable or painful but it is frequent. Day 2: Followed the plan exactly as above. I didn't feel like I was moving at a faster speed today. I did feel super energetic but not like the first day. I tried the shake with ice this time and blended it for a longer time. It tasted incredible! Just like a super yummy chocolate milkshake. Again I was not hungry and basically had to force myself to eat. I roasted my veggies instead of steaming them and I was a lot happier at dinner time! Day 3: Followed everything as above. Night time cleansing was not too great today. I had to get up from sleep a couple of times. Day 4: Followed the plan exactly. Had stir-fried veggies to change it up. Cleansing was way better today. Day 5: Followed the plan almost exactly as above. I forgot to take one of the Skinny Burn supplements. I had lean beef as my protein with dinner. Yum! Haven't had beef in a long time. Day 6: Love the shakes and Skinny Burn but looking forward to stopping the Skinny Cleanse! One more day and counting!! Had Salmon today! Yummy, Yummy! Day 7: Yay!! I made it. I completed 7 days of the Skinny Jane diet. No cheating, no deviating and following it exactly as directed. I can't wait to see how much I lost when I weigh in. My Thoughts: It is a great diet that will help you get a jump start on weight loss. Sometimes losing a good amount of weight when you start a weight loss plan can motivate you to continue. If you are somebody that likes to see fast results this would work for you. One thing to really consider is the cleansing part. Keep in mind that you will go to the bathroom a lot throughout the day. The shakes are delicious and really do keep you full. I would probably continue drinking the shakes here and there as my breakfast. They also include a great meal plan that gives you exact details on what to eat. You can find more information about the Skinny Jane diet here: http://www.skinnyjane.com/ Follow their facebook and twitter pages for all the latest news. Next Week: Back to my calorie counting and yummy healthy recipes. I have my walking playlists all ready and an exercise band to exercise with and review! Can't wait to hit my 2 month mark! This sounds like an interesting diet. How do you not get hungry though? Holy cow! That is an amazing weight loss! You go, girl!! Wow, you've lost 30 lbs and are doing great with your eating! Can you imagine if you had to wear a 30 lb backpack around the house everyday? You are helping yourself tremendously - congratulations! That is so commendable. I'm trying to lose 5 pounds to start with and it is so dang hard. I want to sit in front of the t.v. in the evenings and eat. It's my reward for all the shiz I put up with during the day! Need to find something else pronto!!! WOW - keep it up, girl!! Wonderful job girl keep it up! Very inspiring! I need to get started on losing weight. It sound like you have a great plan. I found you at X-Treme Blogging and am glad I did. I hear that protein is great for losing weight. Congrats on the job of keeping up with the regimen. That looks really great :) Protein is such an important part of losing weight. You're loosing it girl! Way to go, to second Bliscka I have heard eating more protein will help with weight loss. Awesome job on loosing almost 30 pounds! After this baby is born and back on a diet and exercising so I will have to check out Skinny blend. I am all for a good protein shake. The chocolate flavor sounds yummy! I have the banana flavor, and I really like that mixed with ice, almond milk, and half a banana after dinner. It keeps me full until bed. That cleanse sounds like I would have to be real careful--I am not always home during the day-I am at clients--so that might not work for me. The rest of it sounds intriguing-I will check it out. This is an interesting cleanse. As a personal trainer I'm not really big into cleanses because many severely restrict your calories and do more harm than good, but I'd have to see more about this one to make a real judgement. Thanks for the review! Wow that so nice to hear that you are doing great on your goal. Congrat to you. Congratulations! You are inspiring me. It's so hard to lose that baby weight. Stay positive! Congratulations on your weight loss! I have plateaued on mine it seems but I don't want to diet too much since I'm breastfeeding. This sounds like it's a good diet while breastfeeding. Congrats on your weight loss! I commend people who do diets. I can't diet because I am too picky in what I eat plus I like eating what I want. I have lost about 25 pounds since December 28th though. 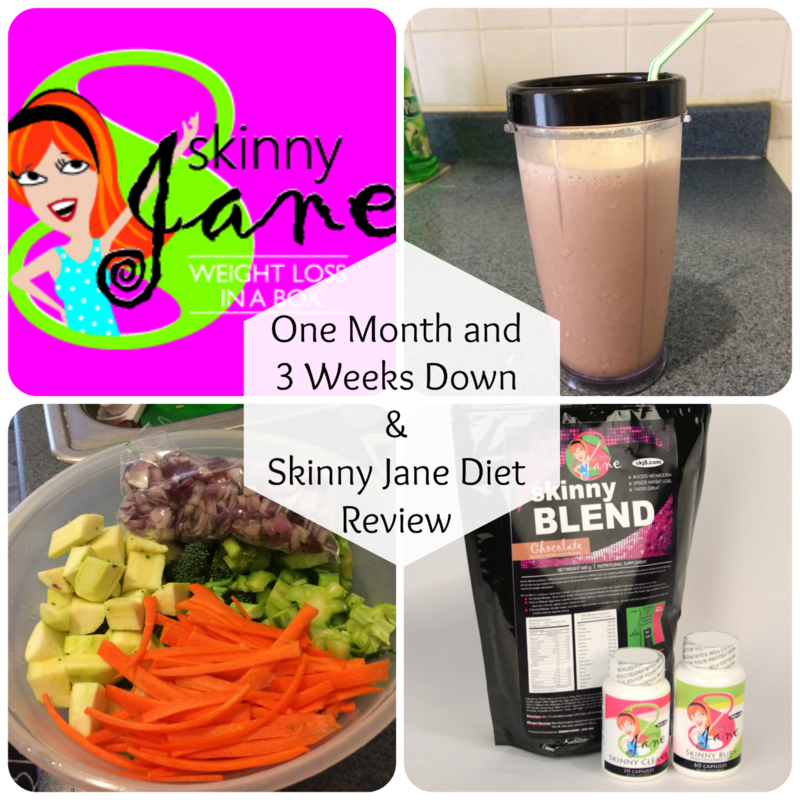 Thanks for sharing about Skinny Jane! I've never heard of them and will look into it. I wonder if I could stick to something so strict. You are working so hard! That is an incredible weightloss for one week. After my girls weekend this past weekend I think I need a cleanse. 9 lbs is fantastic! Congrats on seeing it through as you anticipated from the get go! It sounds like an awesome plan if you don't want to lose so much weight. It can be doable once in a while. So glad it's working so well for you. Good for you for sticking with it! I staretd counting calories again. Hope to lose a little bit of weight. Haven't heard of Skinny Jane before, but it does look interesting. Great results! I'm so happy it's working so well for you. Great work! Congratultions! you make me more motivated also! I am going to be doing this diet soon as well! Thanks for sharing now I know what to look forward to! Love it! Congratulations on your weightloss! Weight loss definitely involves a lot of will power. That's for sure! Good for you for getting through and not deviating. It's definitely a challenge! Please keep us updated! It will also help with motivation. Thirty lbs down is great! Congratulations. I am actually buying a blender so I can start doing some things like this. I have to lose weight before we try to conceive another baby. Wow what amazing results! I might have to try this! Congrats! Man, that sounds like such a yummy diet! Congratulations!! Wow! Way to go on the weight loss. I am always hesitant to try plans like these but this actually does not sound to bad! I will look into it. This looks good to me with great results! Thanks for sharing! Whoa - now that's a lot of weight already. I'm glad you are losing weight - I am on a weightloss journey myself too. Chocolate Sounds Good To Me!! If you have few pounds to lose any diet that you choose will work. But if you are like a good majority you have thirty or more pounds to lose then your choice will go along way to your success.